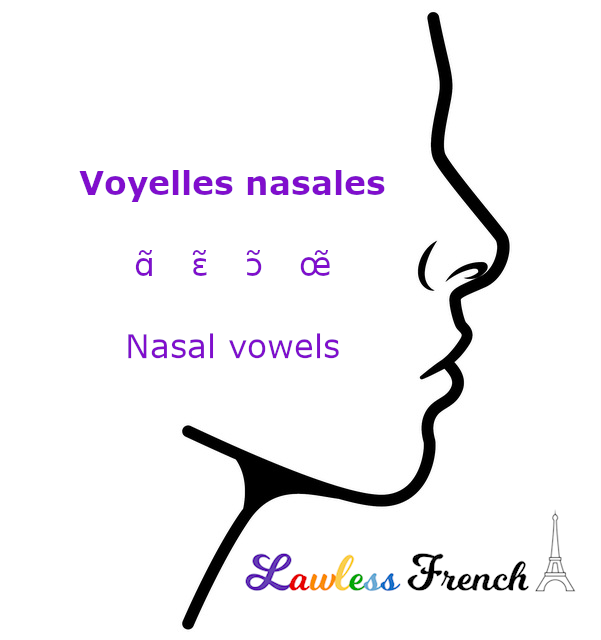 Nasal vowels are pronounced by passing air through the nose and mouth, in comparison to oral vowels, for which air passes only through the mouth. Any vowel plus M or N at the end of a word is a nasal vowel. A vowel plus m or n anywhere else in a word is nasal if the m or n is followed by another consonant. When it’s followed by a vowel, the first vowel and the m or n are both "voiced" – that is, pronounced separately, rather than as a nasal vowel. You might not know it, but there are nasal vowels in English. The difference is that in English, the pronunciation of m or n is what causes the vowel in front of it to nasalize, whereas in French, the m or n is silent, serving only to nasalize the vowel. You can practice the four sounds with the phrase un bon vin blanc. There’s no vowel called the "nasal e." The spellings en and em are sometimes pronounced [ɑ̃] and sometimes [ɛ̃] – see those lessons for info. In much of France, [œ̃] has disappeared – it’s pronounced [ɛ̃] instead. Tout d’abord, merci pour votre effort. Ce cite est excellent! Isn’t it true that pain, vin can be pronounced either with the nasal i or nasal a? Il y a une leçon sur chaque voyelle nasale, avec des fichiers de son. Vous pouvez aussi entendre la différence dans la phrase un bon vin blanc ci-dessus.